Ada Augusta Byron was born on December 10th, 1815, daughter of Lord and Lady Byron (yes, that Lord Byron). After her parents' separation, her mother, determined that Ada stay as far away from poetry as possible, encouraged her interest in mathematics and logic. During her childhood, Ada developed an interest in flying, and took to studying the mathematics of 'Flyology', creating wings based on the proportions of birds. Through her tutor, Mary Somerville, Ada met the inventor Charles Babbage. Babbage was obsessed with building a calculating machine called the Analytical Engine, which, had it ever been built, would have been the first computer. Babbage and Lovelace became great friends and corresponded about the Engine and other mathematical topics. An Italian mathematician, Luigi Menabrea, wrote a description of the workings of the Analytical Engine. Being an accomplished linguist, Ada set about translating this work into English. She added a few notes of her own to the translation – the notes ended up being longer than the original text, and contained what is commonly thought of as the first ever computer program. Lovelace's legacy goes beyond her groundbreaking code – she also thought deeply about the scope for computation in everyday life, predicting mathematical music, and neuronal modelling. 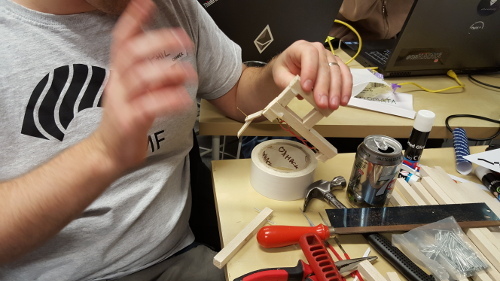 Back in November, the folks at the Oxford Hackspace kindly hosted our hackathon to celebrate the life and works of Ada Lovelace. The planning for this started over a year ago. 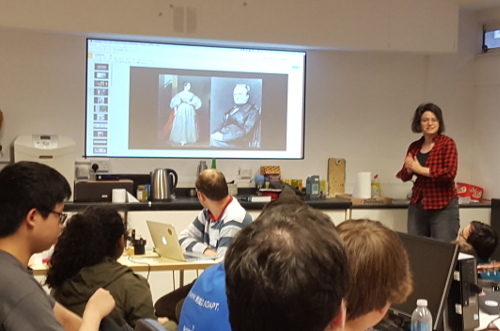 The university has held a lot of celebrations for Ada Lovelace's 200th birthday this year - a symposium, a workshop, exhibitions, and a youth hackathon. I tagged along to a couple of planning meetings with Prof. Martin, and got to read some original texts and meet some wonderful experts like Betty Toole, Doron Swade, and Sydney Padua. 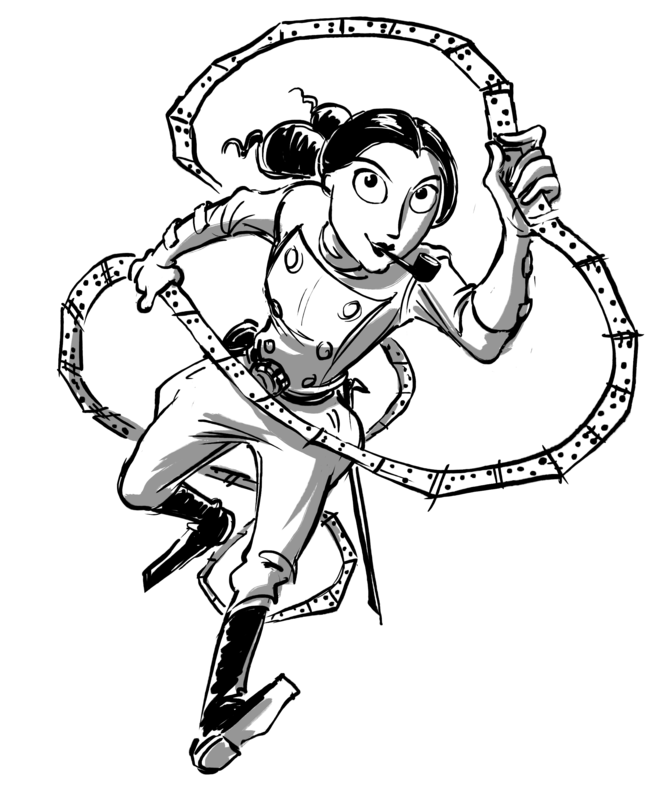 I had the idea to hold a hackathon around Ada Lovelace's legacy - there were a lot of cool possible projects that immediately came to mind from her predictions. She talked about creating a "calculus of the nervous system", which reminded me of the people who made a robot that responded to stimuli based on a model of the brain of a nematode worm, she predicted mathematical music, and she played with flying machines. 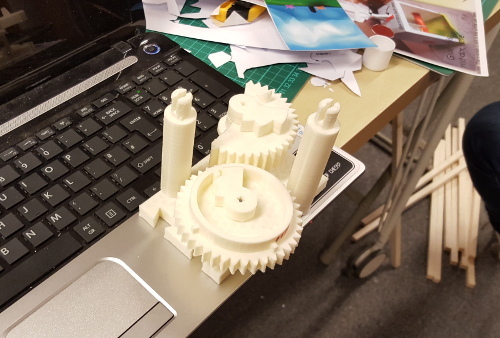 Additionally, the advent of cheap 3D printing means that we could make systems of cogs to recreate Analytical Engine components. The next task was to find funding, supplies, and a location. 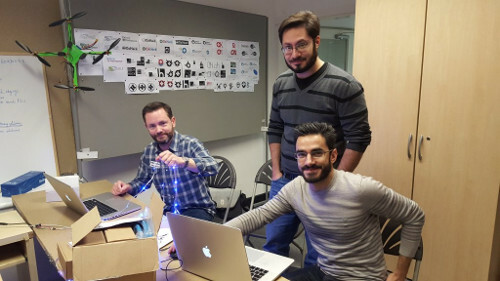 With brilliant timing, the Oxford Hackspace, which was previously located in a very fun but very small room in an artists' collective, moved into a new, much larger space just before the hackathon date. Taking the lead on attracting sponsorship was a new experience for me. I've been involved in crowdfunding before, but not in this kind of focussed way. After taking advice from wise friends and reading "Getting to Yes", I sent out emails offering different levels of sponsorship, with accompanying different levels of advertising. It's fortunate that as a student, I have access to large mailing lists (everyone in Computer Science, for example) so emails that I sent to advertise the hackathon had a large audience, making them good for potential sponsors. My offer was picked up by Corriculo, who generously sponsored the whole event. Emailing companies that sell components and kits was also surprisingly fruitful. 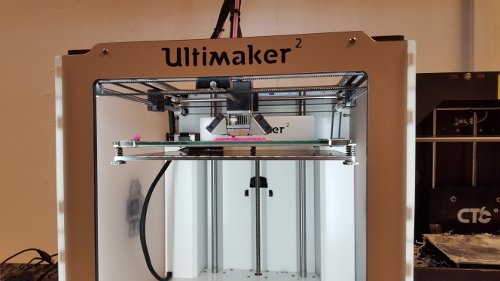 A GoPiGo robot and a lot of 3D printer filament were donated to us by a couple of businesses who responded to my emails. Attracting participants was the easiest part - I sent out some email blasts and gave out flyers at the hackspace. We had some Oxford students, some local folks, some teenagers, and a group of people all the way from Brunel! Eventbrite was a god-send for organising selling tickets to so many people. 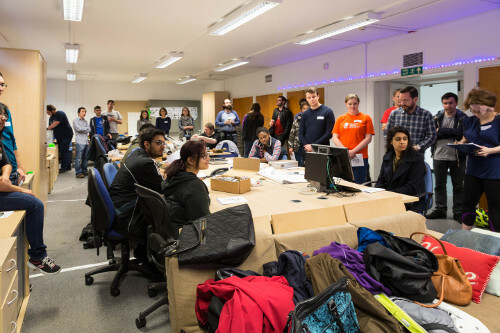 45 people signed up online, and there were around 10 experts from the hackspace volunteering as well - a good number of people, although perhaps slightly stretching the limits of the space available. I decided to charge £5 per ticket, partly to add to our funding, and partly to make sure that the people who signed up had a real intent to attend. 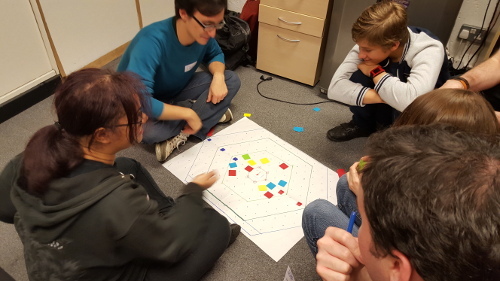 The hackathon itself was run in an "unconference" manner, getting knowledgeable people to volunteer their skills and their project ideas and letting people form groups, then coming back together for plenaries to discuss what we'd made. I also roped three people into doing short talks on their areas of expertise: the excellent Peter Lister introduced us to Arduino electronics, the brilliant Paul Murcutt explained neural networks, and the glorious Sydney Padua taught us about the Analytical Engine. ... and were used to produce this part of the Analytical Engine adding mechanism! The Flyology table tried to create an ornithopter. One group made an augmented reality version of a Capture the Flag game, which looked super fun. The OpenWorm gang were working on a SPARKLY calculus of the nervous system. For catering, I decided to buy enough pizza from Domino's to feed everyone - margarita and pepperoni are safe stalwarts, and we also got some gluten-free and vegan pizzas (go for the thin & crispy base, with no cheese and allll the veggies). They were very popular! I spent much of the time running around, live-tweeting and corralling people, as well as eating pizza and making a somewhat poor attempt at making a flying machine. 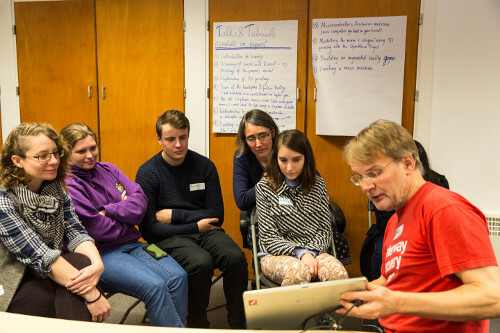 I had a very glamorous assistant, Eileen, taking photos for me, Jared working the 3D printers, John running a workshop, and Lauren co-ordinating skill-sharing. 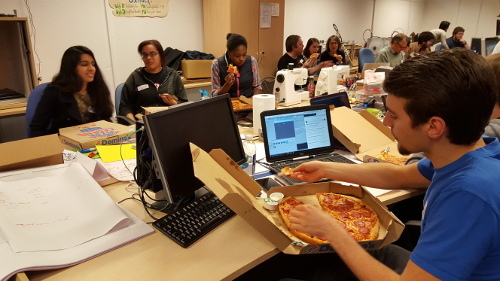 The aftermath: the hackspace gained some new members, and everybody left happy, having learned some new skills. 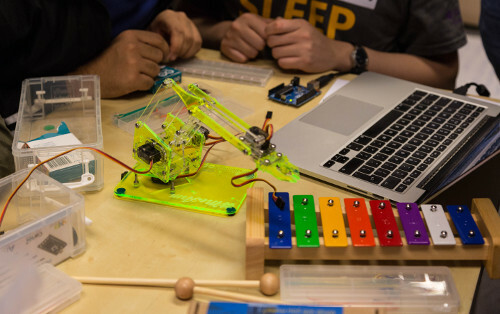 One group spent some time trying (fruitlessly) to use a robot arm to play a glockenspiel. All around, this was a completely wonderful (and remarkably educational) experience. It's amazing what can happen if you rope together a group of talented people to work on a cool idea. Next Next post: Minecraft Pocket Edition - now with carrot cake.